The use of magnetic field measurements for airborne detection of submerged submarines has a history that goes back to at least World War II. 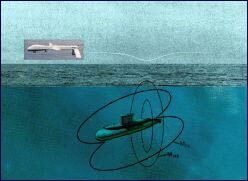 The technology makes use of the fact that a submarine is in effect a large magnet, and its magnetic field causes localized changes (“anomalies”) in the earth’s magnetic field, which can be detected by field measuring instruments – magnetometers. Polatomic has developed a laser-pumped scalar magnetometer for use in Anti-Submarine Warfare (ASW) applications by the Naval Air Systems Command (NAVAIR). This system, known as the Multi-Mode Magnetic Detection System (3MDS), is planned for deployment in Unmanned Aerial Vehicles (UAVs) and ASW helicopters. The picture below illustrates the concept. 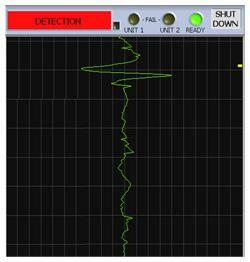 The 3MDS is “multi-mode” in that it operates in Extremely Low Frequency (ELF) mode as well as conventional MAD mode. 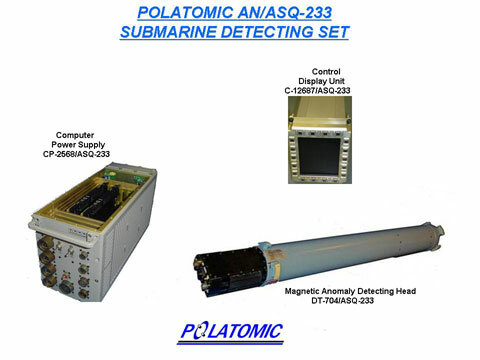 The laser magnetometer system designated the AN/ASQ-233 shown below is suited for new patrol aircraft such as the Navy MMA program and as a replacement for existing magnetic anomaly detection (MAD) systems in existing ASW aircraft. The AN/ASQ-233A Digital Magnetic Anomaly Detection (DMAD) Set is an advanced laser-pumped Helium magnetometer system designed to detect sub-surface magnetic anomalies caused by submarines. The AN/ASQ-233A is suitable for fixed wing or helo applications. Sensor – Houses multi-axial Scalar and Gradient Magnetometers with Electronics and Laser Subassemblies. The Sensor also provides data for compensation of magnetic signals caused by aircraft maneuvers and environmental sources. Control/Display – Controls the DMAD Modes and sub-functions. It receives raw and compensated Magnetometer data and formats it for display, storage, and post-mission data extraction. This unit processes, displays multiple band-pass signals, and analyzes their characteristics to identify and declare anomaly detections. installation into Helicopters, UAVs, UUVs for sea-buried mine detection, and space craft for Earth and planetary magnetic field studies (Cassini Saturn Mission), and underwater sensor arrays. Sensor: 28 VDC, 35 Watts Max. Control/Display: 28 VDC, 100 Watts Max. The AN/ASQ-233 MAD system shown below is composed of three basic components.